I hope you know by now that I would never promote something that I didn't wholeheartedly believe in. As I was on Pinterest one day I came across Just a Girl and Her Blog. Actually if we're being honest, Josh came across it and sent me the pin knowing I'd like it. And was he right! Not only did I love the one article he sent me, I fell in love with her blog! It was one of those where I spent way too much time searching through archives to try to catch up. Not only do we share the same faith, but she lives in a 3 bedroom townhouse... holla! One of the things I quickly saw was that she wrote an ebook about blogging! While I have been blogging for almost 4 years, I will be the first to admit that I have a lot to learn. I really started this corner of the internet to document our life and projects while also beginning my embroidery business. I've tried to keep the focus more open rather than narrow. Instead of just being business, or just being personal or just being home/DIY, I like documenting a little bit of everything. 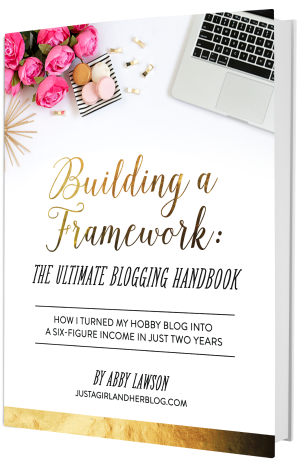 While on Abby's blog I realized that she has written a book* (not just for established blogs but also for beginner blogs!). This book has been the perfect stepping stone for me to guide me from my decision to turn this blog into more of a job than an hobby. I finalized my disclosure/privacy and comment policies and update my copyright info (found at the bottom of the blog). Her book guided me through exactly how to set that up and what exactly needed to be included. And if you ever want to make money through a blog you HAVE to have one. Because it is a PDF ebook, it's super easy to search within the text. So if I want to jump right to a page, it's easily set up to do that. Also the table of contents is phenomenal and I love that she links outside sources right there do I can quickly jump screens to get more info. PDFs for the win. how important leaving comment love on other blogs is! While this is my FAVORITE part of "blogging" it's also very time consuming. I tend to get sucked into others blogs and ideas start pinging in my brain. So it's a love hate relationship for me! But so necessary! I love sharing our life through the blog. To me it's never been a pain to post... if I don't post or I have a small break it's genuinely because our life is crazy or things are happening. She inspired me to do what you love! Try to connect with brands that you use and love. And don't be afraid to put yourself out there. I was terrified to start my blog. But I knew it was something I wanted to do and as I've found my niche it's something I look forward to doing! She explains things so well and so easily that it makes me (who knows NOTHING about computers/web design) understand the blog/computer lingo! Again, while I've been around a while, and I know how to post, there is much more to running a blog. Which platform should you use? Wordpress? Blogger? What is good content? What about photography? The book covers EVERYTHING, including utilizing social media the best way possible. Click here* to grab your copy! So if you are on the fence about starting a blog or are already blogging but aren't quite sure how to take it to the next level, then I highly encourage that you grab a copy* for yourself. Just in the last month I've had multiple people ask me how to start a blog. And while I'd LOVE to sit down for coffee and explain how I got started, there just aren't enough hours. So consider this book our coffee date. **This link is an affiliate link. See my Disclosures for more info.